Could we finally be seeing a new Blade movie in the near future? There have been rumors swirling for several years that Marvel has been looking to bring back the vampire hunter for a new bloody adventure on the big screen. Yet, nothing has materialized. Now, we have a tantalizing rumor that suggests not only is the time finally coming, but that the project will be R-rated and will see Wesley Snipes return to his role from the original trilogy that kicked off in 1998. Again, as always with this sort of thing, we must caution that this is only a rumor for the time being. It's not coming from anyone directly involved at Marvel Studios, nor has anyone involved in the alleged project come forward to confirm its existence. 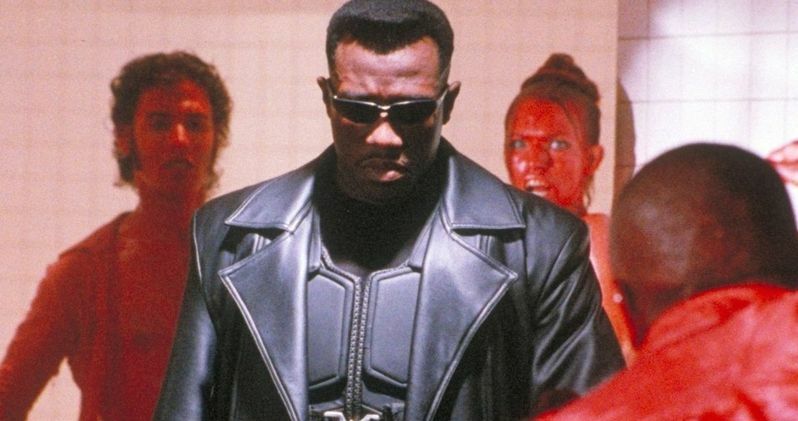 That said, a new report states that Marvel is quietly working on an R-rated Blade movie with Wesley Snipes expected to return in some capacity. The studio reportedly already even has a script, though it's not clear who wrote it at this point in time. Further, it states that Eric Brooks, aka Blade, will be training his daughter, likely Fallon Grey from the pages of Marvel Comics. There has been quite a bit of speculation in the past that, if Marvel were to revisit Blade with Wesley Snipes, it would be in a passing the torch capacity and that Fallon Grey would be used in order to make that happen. While there is no guarantee this project sees the light of day, even if it is actually being developed behind the scenes, there are a few reasons to think this rumor may have at least some, if not more than some, truth to it. Wesley Snipes made waves last year when he revealed that he has not one but two different Blade projects in the works with Marvel. Or, at the very least, he's putting them together and talking to Marvel about it. That, coupled with the fact that the Disney/Fox merger is expected to close this month makes it possible for this project to exist in a historically PG-13 Marvel Cinematic Universe. Disney chairman Alan Horn recently stated that under the Fox banner they can make R-rated movies that the studio wouldn't be able to otherwise. This implies that they're going to keep Fox as its own studio that will operate under the larger Disney banner. Reaching a bit here, it's possible we could see them develop R-rated Marvel projects under the Fox arm, as to avoid any branding issues. While some of that is speculative, it seems inevitable that Disney will experiment with R-rated comic book movies at some point. Especially with Deadpool being such a huge success. And Disney loves money. Why not do some of that experimenting with Blade? We'll be sure to keep you posted as any details regarding the alleged project come to light. This news was first reported by We Got This Covered.